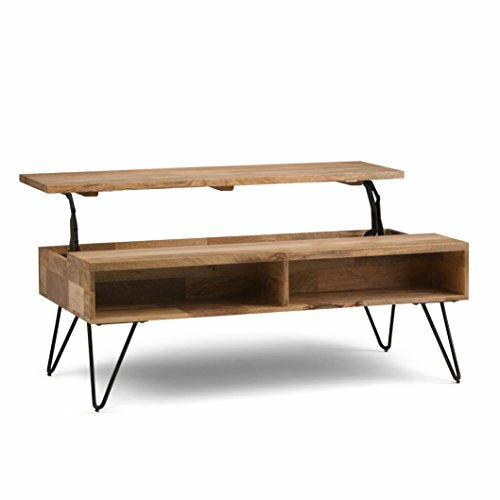 Lift Top Coffee Tables? Yes! Have you ever seen these amazing coffee tables that lift up? 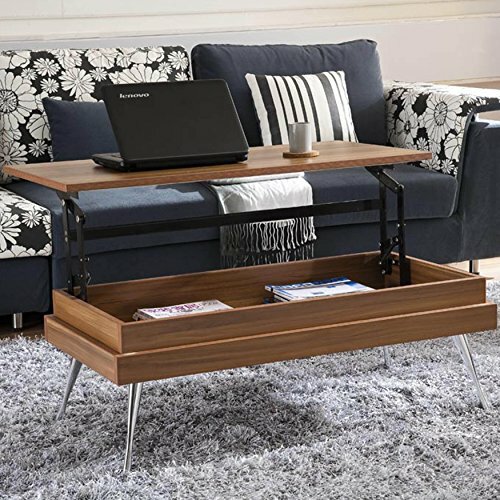 A coffee table that can be used not only for serving coffee and tea to your guests but also to play board games, work on your computer, read the paper and eat your dinner! All that without having to leave your couch! 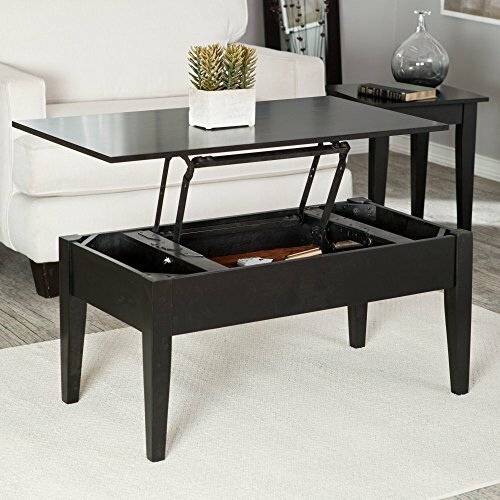 These beautiful lift top coffee tables also have a pretty nice storage compartment underneath that fits your favorite board games, newspapers and magazines inside! *As you can see in the picture, the top will raise up so it makes it easier for you to eat, do your crafts, so on and so forth! Not to mention beautiful, classy and affordable! Even though they look expensive they are not! *This one has a nice black finish. 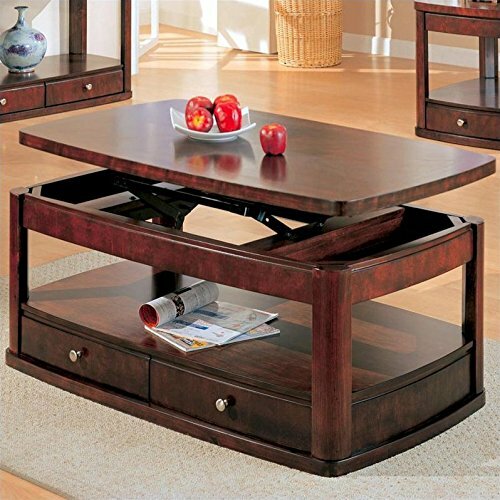 It is a very stylish and classy, not to mention very affordable, black wood coffee table that raises the top! It looks gorgeous when you pair it up with a beautiful white couch, just like in this picture! The storage compartment is pretty spacious too! 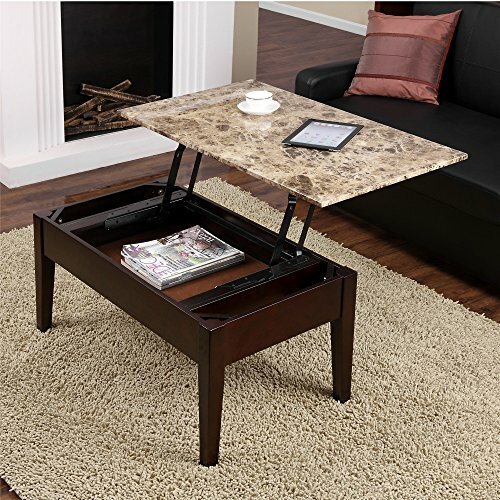 It is a beautiful coffee table with a cool faux marble top that lifts up. The table is pretty sturdy, made from solid wood! This is a heavy and stunning wood lift-top coffee table! I love the beautiful cherry wood finish and the cool and very stylish design. It spells class and elegance! I also LOVE the nice storage space underneath and handy drawer. What a gorgeous ‘rustic’ mango wood lift-top coffee table! The cool double storage compartment right underneath fits a few books and your remote controls. A wonderful and functional piece! *Beautiful piece that will last for a very long time! *Have you ever wondered why furniture nowadays seem to last much less than our great-grandparents solid pieces? I remember having a dinner table that was passed down about 4 generations! This almost doesn’t happen anymore, so anytime I find a sturdy piece of furniture I get really excited! If you can spare a few bucks more, always try to buy something solid, heavy and sturdy. This is a high-end lift top cocktail table that will probably last for decades! 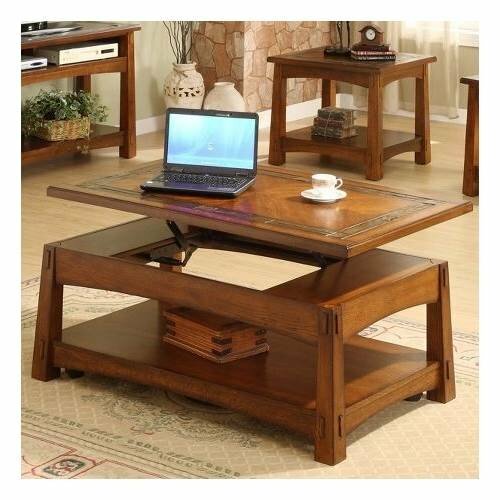 It’s gorgeous and very sturdy, made from solid hardwood solids and oak veneer. It also has a very spacious bottom shelf, as you can see in the picture. Perfect to display your favorite books and magazines! It is a very elegant piece that will make your living room even more stylish and attractive! 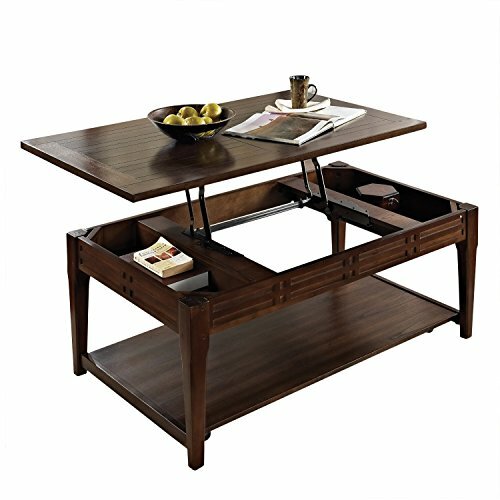 Very Elegant High Quality Lift Top Coffee Table with Storage! 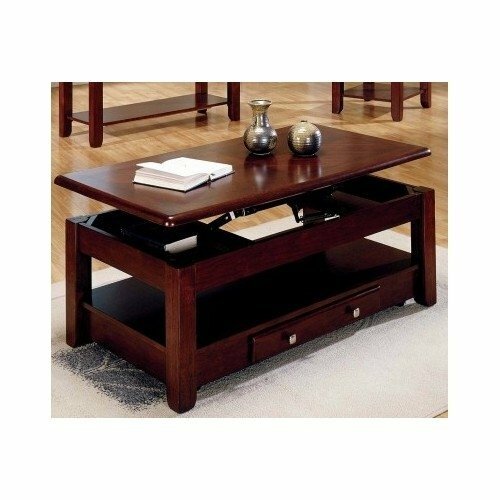 This is a very sophisticated rectangular lift-top coffee table in a beautiful cherry wood finish! Perfect piece to give any room an instant ‘boost’ in sophistication and style! *It’s nice that we can almost ‘smell’ the table from this picture right? It looks sturdy and it feels sturdy! Simply gorgeous! And last, but not least, I present to you this beautiful and very practical walnut finish rectangular coffee table that lifts up! I love walnut color furniture! The storage space underneath is pretty neat! Will fit lots of books and magazines! The Most Unique Coffee Tables!